If you’ve been following along on IG, you’ll know we teamed up with fashion influencer and content creator, Tania Sarin, to make all her closet dreams come true! With a moody aesthetic that’s all her own, and a super chic sense of style, Tania’s own personality served up plenty of style inspo for the space. Looking to showcase some of her most current pieces, Tania wanted a space where she could still entertain, shoot looks, and merchandise some of her favorite accessories. The added curve ball in creating this space - it also needed to serve as a bedroom for when guests are in town or friends need a place to crash! A first of its kind, we teamed up with AllModern to create this convertible closet/bedroom with an elegant sleeper sofa. They were also so generous in helping incorporate lighting, accessories, and other furnishings! The styling and accessories help to elevate the room, so it feels like an extension of the other living spaces. Meanwhile, smaller accessories are neatly tucked away in soft suede inserts. The space is a modern, almost masculine mix of dark woods and gold-tone finishes. Contrasted with velvety soft fabrics and a plush area rug, the design is the perfect complement to her tailored mix of clothing and accessories. A curated collection of bags (all shapes and sizes!) are neatly displayed in a custom wood cabinet. Each cubby is an opportunity to merchandise with her pieces, and less structured totes are hung from hooks. We incorporated floating shelves for a boutique-like display of Tania’s favorite boots and shoes! In this way, her accessories become artwork for the space, and immediately inject her personal style. 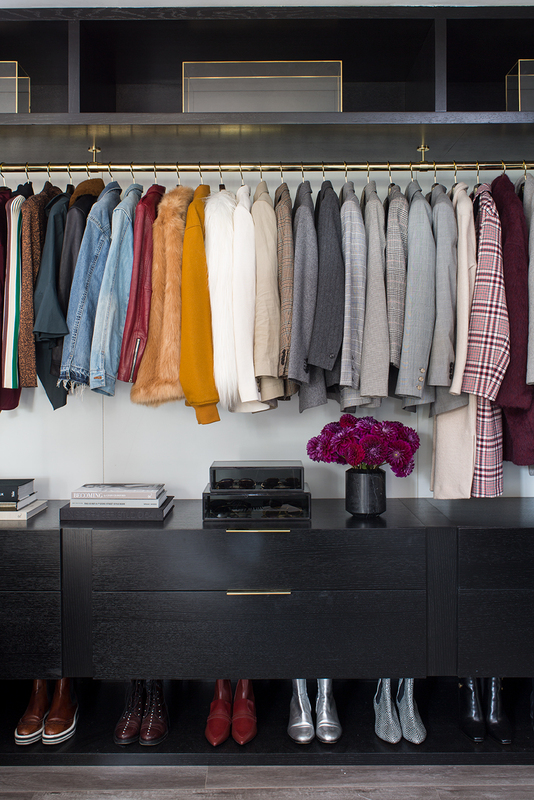 The closet came together as the ultimate chic retreat for Tania! She can dress in here, have friends over, and enjoy being in the space! Three of her favorite prints found the perfect home above the sleeper sofa, and help to showcase her signature style in an artful way. Stay tuned for a full feature in the upcoming issue of Angeleno Mag!